Karien van Gennip serves as CEO of ING Bank France since October 1st, 2015. ING in France is comprised of ING Direct, the leading online bank and ING Wholesale Banking, an international top 5 player. Karien joined ING Group in the Netherlands in September 2008 as Director of Group Public & Government Affairs. In September 2010, she was appointed Director of Private Banking & Investments. 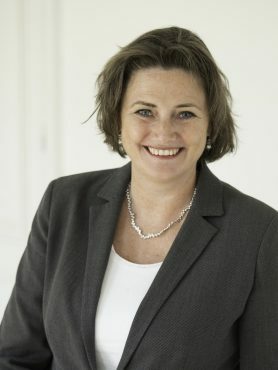 From 2003 to 2007, Karien served as State Secretary of Economic Affairs/ Minister for Foreign Trade in the Dutch government with responsibilities for bilateral and multilateral Foreign Trade, entrepreneurship, regional policy, investment climate, and consumer policy. She also served as member of the Lower House of the Dutch Parliament (2006-2008). Karien van Gennip began her career in 1994 as a management consultant for McKinsey&Company in Amsterdam, and later in San Francisco. In 2002, she continued her career with the Dutch Authority for the Financial Markets (AFM). Karien was previously a member of several Supervisory Boards in the Netherlands (eg. SOS Children’s Villages the Netherlands, Cordaid, Deltares). Karien continues to serve as a Board member and vice chairman of the International Chamber of Commerce. In 2017 she was a member of the steering committee of the Institut Montaigne publication ‘L’Europe dont nous avons besoin’. At 49, she is married with four daughters and lives in Paris. She holds a Master degree of Delft University of Technology and an MBA from Insead (1995, Dean’s List). In 2008, Karien was elected Young Global Leader by the World Economic Forum. La finance verte, reflet de nos aspirations responsables ?